As part of the World Education Forum 2015, the 2015 NGO Forum, 18-19 May, provides a space for Non-Governmental Organisations (NGOs) to meet among themselves and agree on a collective civil society vision for education post-2015 as well as reflect on strategies for civil society engagement in the post-2015 education agenda. Over 300 organisations took part to debate and agree on a collective civil society vision for education, and adopted a landmark declaration to help shape the education agenda beyond 2015. The development of the post-2015 education agenda and the role of the World Education Forum (WEF) 2015, by Dennis Sinyolo, Senior Coordinator at Education International (EI). 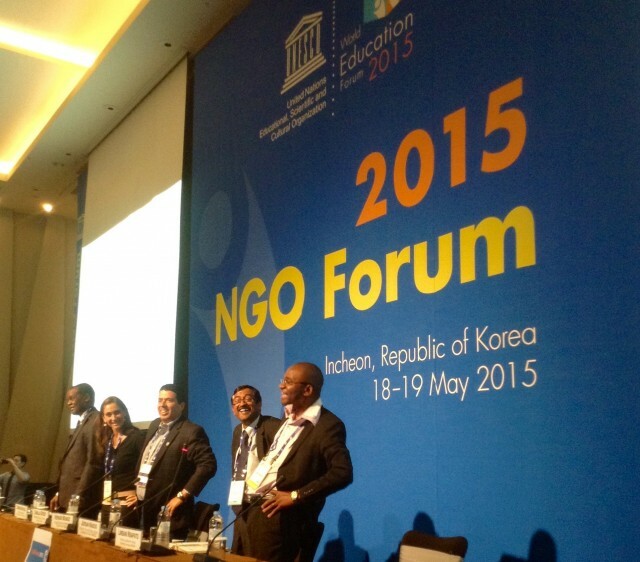 World Education Forum 2015: working modalities and civil society participation, by Mr Jordan Naidoo, Director at EFA and Global Agenda Coordination Team, UNESCO. However, civil society actors expressed concerns over a series of substantial issues, based on their collective experiences to hold governments to account for the EFA goals over the last fifteen years. A special emphasis was done with the importance of adequate financing, understanding that the post-2015 education agenda cannot be achieved without it. a. National governments should absolutely adhere to international benchmarks for ensuring increased domestic financing for education, by allocating at least 6% of the GDP and at least 20% of the national budget to education. The use of a range of 15-20% and 4-6% as it currently stands in the FFA dilutes this essential benchmark. b. More attention needs to be paid to expanding the domestic resource base. Whilst we welcome the FFA´s references to expanding the tax base and challenging harmful tax incentives we need to oppose not just tax evasion but aggressive tax avoidance, which, though technically legal, can be immoral in denying countries the funds needed for delivering on the right to education. We join the call for an empowered intergovernmental body on tax which is mandated to set tax rules and empowered to enforce these rules – as a key step to ending the abuse of tax havens. c. Donors should commit to clear targets – whether doubling of aid to basic education or ensuring that at least 10% of aid is spent on basic education. The Dakar pledge on financing needs to be boldly reasserted in Incheon and delivered on seriously in the coming years. Donors need to prioritise their aid on low income countries and fragile and conflict affected countries. Aid to education in humanitarian contexts needs to be at least doubled from the low base of 2% to 4%. Furthermore, debt cancellation in favour of education should be re-emphasised. d. Governments and donors should prioritise spending on achieving the goal and targets for the most marginalised communities. Spending to increase equity improves quality of life for everyone. e. The Financing for Development conference in Addis Ababa must come up with a comprehensive framework for financing the post-2015 sustainable development goals. We call on governments and all partners to ensure that the Addis outcome document has a commitment to financing the education goal and all of its targets, with the specific minimum benchmarks for domestic financing and external support described in paragraph 14 (a) and (c) above. f. The Global Partnership for Education should align fully its strategic plan and financing mechanisms to the collectively agreed education goal and targets. It should support countries to develop comprehensive education sector plans and should avoid creating parallel goals, objectives or targets. g. Clearer commitments are needed to ensure all public money (including aid money raised from taxpayers) is spent on public education and is not supporting or subsidising for-profit provision in any way. Private sector contributions to the education sector should aim to reinforce the need for greater public investment in education and research rather than to replace the role of national governments. We therefore, reaffirm education as a public good and reject calls for increased privatisation or commercialisation in education, including any support for low fee private schools and for-profit universities. Equally we oppose any trade agreements that include education as a commodity and facilitate liberalisation of education services and loss of rights, as in the case of the Trade in Services Agreement (TISA). We also call on all governments to put in place stronger regulation of private provision of education to prevent abuse, fragmentation and increasing inequity. We furthermore expect that the education goal and targets will remain integrated as part of the United Nation´s Sustainable Development Goals to be adopted in September 2015, thus recognising the critical role of education for social, economic and environmental justice and the indivisibility of human rights. We support the recommendation of the co-facilitators in the New York Intergovernmental Negotiations that where x% is used in the adult literacy, skills and teacher targets, these should be replaced by “all”. Together, we need to continue to make a compelling case that education is at the heart of the post-2015 agenda, facilitating achievement of all other SDGs. The new global compact on development requires a new generation of active global citizens of all ages in all countries, developing and sharing the attitudes, knowledge and behaviours which are essential for a sustainable planet. To achieve dignity and social and environmental justice, we need inclusive, equitable, quality education and lifelong learning for all. The declaration welcomes the recognition that civil society plays a crucial role in ensuring governments are held accountable, and that its participation should be institutionalized and guaranteed in all processes. The right to participate in all stages of planning and decision-making must be protected – the declaration strongly condemns the current wave of criminalization of activists and campaigners across the world. More attention should be paid to addressing the root causes of conflict and violence, and that education systems should promote a culture of peace and tolerance at all levels. The Ministers of Education from Latin America and the Caribbean have expressed their commitment with education in their common release.